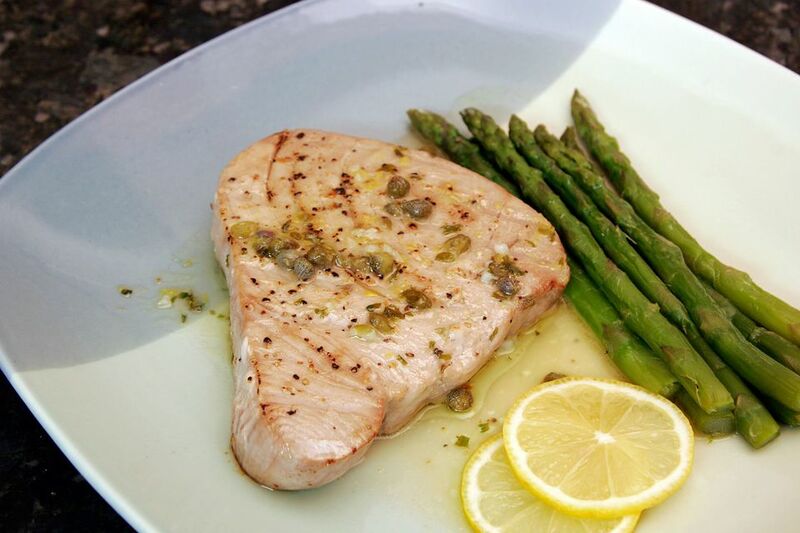 Capers and lemon make a tangy and tasty sauce which complements broiled tuna steaks perfectly. Feel free to cook the tuna on the grill or in a stovetop grill pan. Choose good quality fresh tuna for the broiler or grill. It should look somewhat moist and be pink to deep red. Avoid tuna that is dull or brown. If the raw tuna appears to be flaking apart in places, it might be a bit old. This tuna makes a delicious meal with roasted asparagus or Brussels sprouts and baked potatoes. Or serve it on a simple tossed salad. Heat broiler. Oil the rack of a broiler pan and place it in the oven. In a small skillet over low heat, melt the butter; add garlic, lemon juice, lemon zest, and capers. Simmer for 30 seconds. Stir in parsley. Remove from heat. Rub olive oil over the tuna steaks; sprinkle with salt and pepper. Arrange tuna on the hot prepared pan. Broil about 6 inches from heat for 8 to 10 minutes, turning carefully about halfway through the cooking time. The tuna steaks should still be pink in the middle, depending on how you like your fresh tuna done. Avoid overcooking. Drizzle the warmed lemon caper sauce over the tuna steaks before serving.